Life takes its toll on our feet, and we don’t always give them as much care and attention as they deserve. Feet do have their own defense mechanisms, but they’re not always the most effective. Take calluses, for example, where your body develops thickened, hard skin as a type of armor to protect against repeated rubbing and friction. If it didn’t thicken, the skin would break down and bleed, yet calluses themselves can cause pain and discomfort. While calluses are very common, the good news is that it’s easy to find a hard skin remover to treat them at home yourself. Calluses tend to develop on parts of the skin that are regularly exposed to a lot of pressure and friction. The skin builds up so that the area becomes tougher than in other places. If the skin becomes too thick, the calluses begin to hurt when weight is placed on them, which can make walking painful. 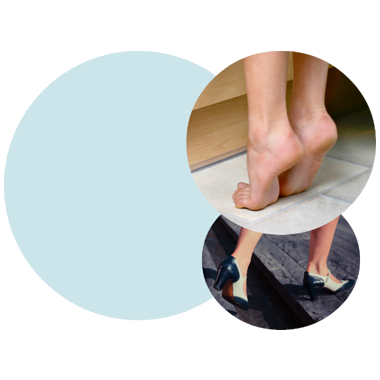 They can develop anywhere, but the heel, ball of foot, outer sides of the smallest and biggest toes and the top of toes are often more susceptible. Calluses also tend to be yellow in color, whereas dry skin on the feet is usually white, or red if irritated and itchy. You may be more likely to develop calluses if you walk around barefoot, wear shoes that don’t fit properly, or wear open-backed shoes. To stop calluses worsening, it’s important to treat them with a hard skin remover and adopt a regular foot care routine to keep them in check for the future. The first step is getting rid of the dead skin cells in the callus so there is less pressure. 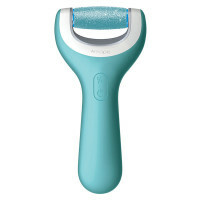 The Amopé Pedi Perfect™ Electronic Foot File with Diamond Crystals is the hard skin remover for tackling calluses, as it gently removes the dead, dry skin quickly and easily. The safety stop mechanism means that callus removal is safe, and with roller heads with different grain sizes available, even thick, tough calluses are easy to tackle. Once you’ve removed the callus, keep removing hard skin to keep them at bay, and check for new calluses regularly so you can treat them before they become painful. Moisturizing your skin with the right product after using a hard skin remover can also help smooth it (i.e. with the Amopé Pedi Perfect™ Daily Moisturizer). Don’t just wait until problems develop to start paying attention to your feet!